The following is a tribute to Invasor, who will be inducted into racing’s Hall of Fame on Friday and who holds a special place in my heart. The strains of Beethoven’s “Ode to Joy” blared over the public address system, as jockey Carlos Mendez, aboard Gran Premio José Pedro Ramírez winner Rock Ascot, stood up in the saddle, flung his arms up in victory, and tossed rose petals from the victory blanket in the air. The massive crowd at Maroñas Racetrack let out a mighty roar to salute the victors. With the music still resounding throughout the track, the winning connections—owner, breeder, trainer, and jockey and their friends and families—were driven in antique automobiles to the makeshift winner’s podium on the track in front of the grandstand. Alongside the podium was a mounted military band in decorative uniforms and cascos (headgear) playing drums, bugles, tubas, and other instruments. Sure enough, seconds later, an explosion of fireworks from behind the podium lit up the darkening blue sky that had already become illuminated by the lights of the racetrack. It was a moment that was both spectacular and surreal—a fitting conclusion to a magical day that saw skydivers rain down on the racetrack carrying banners and flags. Several years ago, one skydiver actually landed on the back of a horse…on purpose. The spectacle of Ramírez day was obvious. The surrealism was due in part to the fact that we were in Uruguay, a country whose location I had to look up on a map. Our trip, at the invitation of the Uruguayan Breeders’ Association, included visits to the Riviera-like resort of Punta del Este, where the rich and famous congregate each summer; the amazing Casapueblo, where nature and art meet to form a kaleidoscope of colors, shapes, and images nestled along Uruguay’s tranquil coastline; and the historic, charming town of Colonia, where you can see spectacular sunsets and the lights from Buenos Aires across the Rio del la Plata that separates Uruguay and Argentina. Our home base, the capital city of Montevideo, has miles and miles of beaches that come alive each day with people jogging, walking, riding bicycles, and strolling with their dogs along the palm tree-lined Rambla. It was at some point during the trip that it hit me. Everything I was experiencing was due to one horse. It was through my articles on Invasor and the contacts I had made in Uruguay that all of this was made possible. I met so many warm, loving people who have become friends, and it was great reuniting with Invasor’s former co-owner Pablo Hernandez. After sharing a number of e-mails with Pablo prior to the Breeders’ Cup, I finally met him in the winner’s circle following Invasor’s victory in the Breeders’ Cup Classic, where he embraced me like a lifelong friend. A melting pot of humanity had converged on the Churchill Downs winner's circle, where Americans and Arabs and South Americans hugged and kissed each other. And from out of the bedlam, came the chant of "Een-vah-SOR! Een-vah-SOR!" with a delirious and disheveled Pablo, accompanied by eight of his friends from Uruguay, proudly holding the Uruguayan flag over his head. Joining in the celebration were media members from Argentina, where Invasor was bred. "This is unbelievable," Pablo shouted above the din. "This is the greatest experience of my life, and always will be. Invasor is still in the hearts of everyone in Uruguay. We are a small, modest country, and we need an idol. We have no idol in football and no idol in politics. Invasor is the idol of Uruguay. He is the 'Horse of the Rio de la Plata." Also cheering wildly for Invasor were thousands of racing fans who had flocked to Maronas Racetrack in Uruguay, where Invasor made the first five starts of his career, including a sweep of the Triple Crown, before being sold to Sheikh Hamdan al Maktoum. It was pure hysteria at the simulcast facilities at Maronas and San Isidro Race Course in Argentina. Alessandro Miserocchi, owner of Haras Clausan, which has since been re-named Haras Santa Ines, was asking $25,000 for the horse. Hernandez and the Vio Bados offered $18,000, and both parties eventually settled for $20,000. After Invasor swept the Uruguayan Triple Crown in brilliant fashion, Pablo and his partners were offered $1.5 million for the horse by Sheikh Hamdan. That was a great deal of money in Uruguay, considering Invasor's total earnings there were $114,070. It was hoped to run him in the country's big championship race, the Gran Premio Internacional Jose Pedro Ramirez, for 3-year-olds and up, but Shadwell's offer was too lucrative to turn down, although one of the Vio Bado brothers was reluctant to sell. "I am 42 years old and have faced many challenges and dilemmas in my life," Pablo explained. "But surely, the uncertainty of whether or not to sell Invasor gave me many sleepless nights. To be one of the co-owners of a Triple Crown winner is something that rarely happens to a Thoroughbred owner, especially in Uruguay. After so many decades of not having a Triple Crown winner, to suddenly realize that your horse has become a national hero to the enthusiastic Uruguayan racing fans is very shocking." In December 2005, Hernandez was contacted by Shadwell, wanting to buy Invasor and fly him to Dubai for the UAE Derby. Pablo had to make a quick decision and was advised by friends that it was something he couldn’t pass up. ”It was not only about the money,” Pablo said. “Here in Uruguay there isn't much possibility to develop a great champion, and I wanted to give him the best opportunity to prove that he was a great horse. We would never have been able to go with him to the United States to run; it is too expensive for us. So, I was backed into a corner. I had no other choice. "I have thousands of images of Invasor in my memory--some that make me weep and others that bring me much happiness. But the bitter memory is the day I had to say farewell to him after traveling with him on the van to the airport. It was a silent farewell, because inside our souls, none of us wanted Invasor leaving our lives. Every time he ran at Maronas, the fans filled the racetrack to watch him run and to try to touch him and take pictures with him. They even tried to get strands of his hair as a souvenir. "The day he departed reminded me of that day years ago when I, like many Uruguayans, emigrated to Europe. I had graduated from dentistry school and went to Spain for a post-graduate in dental surgery. I remember how my grandmother cried silently the day I left. I can understand how she felt, because I felt the same way the day I had to say goodbye to Invasor. It was like saying goodbye to a son you were never going to see again. Although the plane left very early in the morning, a lot of people showed up at the airport to say their goodbyes to Invasor." But that was not the last time Pablo would see Invasor. He traveled to Dubai to watch him run in the UAE Derby, and, of course, he was at Churchill Downs to witness his horse and the pride of Uruguay become an international superstar and Horse of the Year on two continents. When Invasor added the Dubai World Cup the following year, he was crowned Horse of the World. Ironically, when Invasor first arrived at Kiaran McLaughlin’s barn at Palm Meadows and stepped off the van, the first thought from everyone in the barn was, “What kind of allowance conditions can we find for him?” He was very light-framed and had a thick coat of hair. He was given UltraGard and GastroGard and the best of everything, including the best quality hay. Ten months and four consecutive grade I victories later, Invasor was Horse of the Year, winner of North America’s richest race, and reunited in victory with his former owner. Also sharing in the glory was Diego Mitagstein, the pedigree consultant for Turf Diario in Argentina. "I can't speak--my heart," he said. "Bayakoa won the Distaff twice and Paseana won the Distaff, but this is the Classic at Churchill Downs, the home of the biggest race in America." For Pablo, it would be a joyous trip back to Montevideo. But there still were moments of reflection as he looked back at the incredible saga of Invasor. "My partners are still sad," he said. "They are two old unmarried brothers who have lost the reason to go to the racetrack every weekend. I was melancholy, too, in the beginning, but we have made it possible for Invasor to become famous in the best place in the world. He's gone, but he remains a part of my life, and he will be mine in my heart forever." The story I had been following since July had come to a glorious conclusion. Pablo insisted I be in their group photo. Standing there with the Uruguayan flag proudly held high was an experience never to be forgotten, which brings us back to our trip to Uruguay. In addition to staying in five-star hotels and invited to lunch at some of the country’s most prominent breeding farms, I gave a 90-minute talk on Invasor to the media and racing officials at Maroñas, presented the trophy for one of the big stakes on Ramirez day, was interviewed by ESPN South America, had every want and need catered to, and, simply put, was treated like a rock star—all because of a horse. 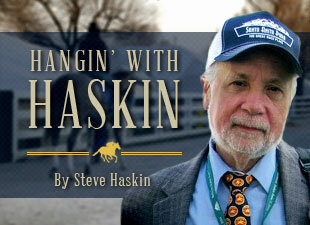 Racing, fortunately, still has a hard-core fan base in the United States, and we still idolize our equine heroes. But Thoroughbred racing here is going through perhaps the roughest time in its history on many fronts. So it was a joy to witness the passion for the horse and the sport 6,000 miles away in a small country most Americans know little or nothing about. When racing ceased for 10 years in Uruguay because of economic reasons, and there was no pari-mutuel wagering, the owners still raced their horses just for the sport of it. Although located in a poor neighborhood, Maronas, with its white cement walls, is looked upon as a shrine by the local residents, who would never desecrate it in any way. Inside those white walls is one of the most well-kept, picturesque, and modern racetracks you’ll see anywhere, complete with a high-tech simulcasting facility and even supervised play areas for younger and older children. As you walk through the ornate main entrance and into the beautiful lobby, there in front of you is a bust of Invasor. It is apparent by now that Invasor was a very special horse to me and my family. During the colt’s career in the United States, I bonded with him as I’ve never bonded with any horse, thanks in part to his unique antics and personality, especially during the spring of 2007 before his untimely injury that ended his career. Every Saturday after arriving on the Belmont backstretch, my first stop was always Kiaran McLaughlin’s barn, where Joan and I would meet up with my friend Dianne, who spoiled Invasor with mints. As soon as she entered the barn, he knew what was coming. Invasor liked attention and liked being petted, but he also would bite. Somehow, and I may be guilty of anthropomorphism and a touch of romanticism, but he figured out how to avoid one in order to get the other. As we approached his stall, all we had to do was point to his hay rack. Invasor would reach over and grab a large chunk of hay. After stuffing as much as he could in his mouth, he would freeze in that position, with his mouth still wide open and locked onto the hay rack. He then would turn his eye toward us. As long as you’d pet him he’d remain in that odd position without moving. Once you stopped stroking him, he’d wait a few seconds and either let go of the hay or rip out a hunk and drop it on the floor, indicating he had no desire to eat the hay and was using it almost as a pacifier. It seems presumptuous to attempt to interpret a horse’s thought process, so I’ll just conclude by saying this was the most bizarre, almost human-like, behavior I’ve seen from a horse. But we’re all guilty of humanizing animals to a degree, like when we say a horse is posing for photographs or he or she loves the camera. Although we know a horse has absolutely no concept of what a camera is or what it does other than it makes a clicking noise, we still say it. From a personal standpoint, I never could have imagined how far the bond I formed with Invasor would take me. Because of this remarkable animal, I met many people in a faraway land that I now consider close friends. I discovered a new culture, new food, and a new, vibrant world of Thoroughbred racing that re-kindled the feelings I had for the sport back in the late 1960s, when all seemed so pure and innocent. But most of all I discovered myself. Cloistered away in my home/office every day, I was reluctant to embark on such an adventure, and it was only after my wife’s constant urging that I finally capitulated. So, my self-discovery was due in great part to her. I still think of Uruguay often and cannot remove that one thought from my head: it was all because of a horse. Perhaps those are words everyone in the industry should remember.